Interstate 395 (I-395) in Washington, D.C., and Virginia is a 13.39-mile-long (21.55 km) spur route of Interstate 95 (I-95) that begins at an interchange with I-95 in Springfield and ends at an interchange with U.S. Route 50 (US 50) in northwest Washington, D.C. It passes underneath the National Mall near the U.S. Capitol and ends at a junction with U.S. Route 50 (US 50) at New York Avenue, roughly one mile (1.6 km) north of the 3rd Street Tunnel. Despite its proximity to I-395 in Maryland, the route is unrelated and unconnected. Streets and Highways of Washington, D.C.
Cars on I-395, leaving Washington, D.C. (in distance) and passing by the Pentagon in Arlington, Virginia. The intersection where I-395, I-95, and the I-495 (Capital Beltway) meet is called the Springfield Interchange. Unofficially, this interchange is referred to as The Mixing Bowl. This moniker causes confusion, because the intersection of I-395, Washington Boulevard, and Columbia Pike several miles north was historically known by that name, and continues to be recognized by the Virginia Department of Transportation as such. I-395 contains a reversible, barrier-separated Virginia HOT lanes facility, also known locally as the "express lanes", with its own entrances and exits, provided as a third roadway of Interstates 395 and 95 between South Eads Street near the Pentagon in Arlington County and State Route 610 (Garrisonville Rd.) in Stafford County, Virginia. During rush hour, the HOV facility operates in the direction of rush-hour traffic and is restricted to vehicles containing three or more passengers. Motorcycles, alternative fuel cars, hybrids registered in Virginia before July 1, 2006, and federal law enforcement vehicles are also permitted to use HOV lanes, even if carrying only one occupant. At other times, the facility is either open to all traffic in one direction or closed to all traffic. In 2012, the exemption was modified to be "open-ended" rather than year-to-year. The facility was initially constructed with a single lane as the first busway in the United States before being expanded and converted to HOV use. Approximately 65% of travelers on I-395 (61,000 commuters) utilized the HOV lanes during the morning rush hour: 32,000 rode transit and 29,000 used private vehicles with 2 or more people. 33,000 commuters (35% of total users) drove alone. I-395 and US 1 cross the Potomac River from Virginia to Washington, D.C., on three parallel four-lane bridges, together known as the 14th Street Bridge. Potomac River crossings for the Washington Metro's Yellow Line and for a major CSX railroad line are immediately downstream here. This site has long been a major Potomac River crossing, with the first bridge constructed here in 1809. Of the present highway spans, the eastern one was built in 1950, the western one in 1962, and the central one in 1972. During an evening rush-hour snowstorm in 1982, Air Florida Flight 90 crashed on take-off from National Airport, hitting the easternmost of the three highway bridges. The oldest span, formerly named the Rochambeau, is now named the Arland D. Williams, Jr. Memorial Bridge, in honor of a passenger of Flight 90 who survived the crash, escaped from the sinking aircraft, and perished in the Potomac River while saving others from the icy waters. The center span is now called the Rochambeau Bridge, and the western span, the George Mason Memorial Bridge. 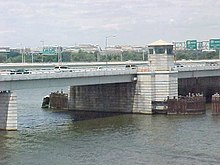 The following names are used for I-395 in the District: the Southwest Freeway from the 14th Street Bridge to the Southeast Freeway interchange (I-695), the Center Leg or Center Leg Freeway from the Southeast Freeway interchange to New York Avenue, and the Third Street Tunnel for the segment of the Center Leg under the National Mall. The portion of Interstate 395 between the Pentagon in Arlington, Virginia, and the interchange with Interstate 95 and the Capital Beltway in Springfield is part of the Henry G. Shirley Memorial Highway, named for a Virginia Highway Commissioner who died on July 16, 1941, just a few weeks after approving work on the new expressway. Originally State Route 350, the full length of the Shirley Highway was opened on September 6, 1949, from south of the Pentagon to Woodbridge, Virginia, along what is now better known as the Interstate 95 corridor. The Shirley Highway featured the nation's first reversible bus lanes, a precursor to today's HOV lanes. View south along I-395 (Southwest Freeway) at Maine Avenue SW in Washington, D.C. Original plans called for I-95 to travel through Washington, D.C., and Prince George's County, Maryland, toward the northeastern portion of the Capital Beltway, from which I-95 presently continues its northbound route. However, neighborhood opposition in the District halted this plan in 1977, diverting planned funding toward construction of the Washington Metro. The only remnant of the Maryland extension is a series of ramp stubs near College Park, which now lead to a Park & Ride. The portion of I-95 within the Beltway became I-395, while the eastern half of the Beltway was re-designated I-95 (and, later, co-signed I-95/I-495). I-395 currently terminates in Washington, D.C., at a traffic signal at U.S. Route 50, which is New York Avenue, near Mount Vernon Square. The District government finalized a deal in 2010 with the Louis Dreyfus Group to construct a 2,100,000-square-foot (200,000 m2) mixed-use development in the airspace over the Center Leg Freeway portion of Interstate 395. The $425 million office, residential, and retail project at the east end of the Judiciary Square neighborhood will also restore the area's original L'Enfant Plan street grid by reconnecting F and G Streets over the freeway. The project was awaiting final regulatory approval and expected to be complete by 2016. In 2015, work began on I-395 in conjunction with the Capitol Crossing, a major real estate project in D.C, part of which lies on top of the highway. The work involves adding a $200 million concrete platform that connects neighborhoods that have been severed by the freeway, creating a better community atmosphere in the eastern edge of downtown. DDOT expected the work would take up to four years. In 2015, the Commonwealth of Virginia announced that the HOV lanes between the Turkeycock Run bridge and Eads Street (at The Pentagon) will be converted to toll lanes as part of the I-395 Express Lanes Extension project. The existing HOV lanes, which run in both directions in some areas, will become reversible HOT lanes for the entire scope of this project, spanning eight miles (13 km). Part of the project involves the reconfiguring of the Pentagon interchange to provide greater access to Army Navy Drive, as well as the closing of the on-ramp—from the southbound HOV lanes to the mainline Interstate southbound—located just west of the Pentagon interchange. All existing HOV interchanges within the project's scope will also become tolled, except for the northbound exit and southbound entrance at Seminary Road, which will remain toll-free while retaining its HOV-only restriction. Once the project is completed, vehicles carrying three or more passengers will still be able to use the former HOV lanes for free. The project is expected to be completed in 2019. Exits in Washington, D.C. were unnumbered until 2008. In 2014, in conjunction with the rebuilding of the 11th Street Bridges and the Southeast Freeway, some exit numbers were converted to a mileage-based numbering system. US 1 south – Pentagon City, Crystal City, Reagan National Airport, Alexandria Southern terminus of concurrency with US 1; left exit southbound; northbound signed as "To US 1"
^ Adderly, Kevin (January 27, 2016). "Table 2: Auxiliary Routes of the Dwight D. Eisenhower National System of Interstate and Defense Highways as of December 31, 2015". Route Log and Finder List. Federal Highway Administration. Retrieved August 21, 2016. ^ Virginia Department of Transportation (n.d.). "Virginia HOV Systems: HOV Rules & FAQs". Virginia Department of Transportation. Archived from the original on February 6, 2006. ^ Morris, Joan; McCord, Jennifer (May 8, 2012). "New Law for Hybrids on HOV Lanes" (Press release). NR12-33. Retrieved May 31, 2012. ^ Quintana, Kala (September 10, 2007). "Many More People Commuting Along I-395/Route 1 Corridor Inside The Beltway Are Using HOV And Transit Than Driving Alone" (Press release). Virginia Department of Rail and Public Transportation. Archived from the original on January 29, 2013. Retrieved February 18, 2013. ^ London, John (September 7, 1949). "Shirley Road Saves Time, Test Reveals". The Washington Post. p. B1 – via ProQuest Archiver. ^ Farmer, Liz (October 19, 2010). "Major development over I-395 moves closer to reality". The Washington Examiner. Retrieved November 2, 2011. ^ "Major work for Capitol Crossing project is set to begin on I-395". The Washington Post. June 23, 2015. Retrieved August 21, 2016. ^ a b Virginia Department of Transportation (July 25, 2017). "I-395 Express Lanes Extension". Virginia Department of Transportation. Retrieved July 30, 2017. ^ Virginia Department of Transportation (2016). "I-395 Express Lanes Northern Extension" (PDF). Virginia Department of Transportation. pp. 7, 16–17. Retrieved July 30, 2017. ^ a b Google (December 26, 2013). "Interstate 395 in Washington, D.C." (Map). Google Maps. Google. Retrieved December 26, 2013. ^ Google (December 26, 2013). "Interstate 395 in Virginia" (Map). Google Maps. Google. Retrieved December 26, 2013. ^ Virginia Department of Transportation (October 14, 2012). "Virginia Interstate Exits: I-395". Virginia Department of Transportation. Retrieved August 21, 2016. Wikimedia Commons has media related to Interstate 395 (District of Columbia – Virginia).